The days are winding down on 2016, and with it passes another year for the human resources practice. This has certainly been a rocky year for the world at large, and nowhere was it felt more ardently in the corporate business world than HR. Our boundaries were tested, our core practices pushed and pulled, and diversity became the foremost conversation across the world due to tidal waves of political upheaval. We were most certainly tested. The question is, how did we do? Did we exceed expectations this year? If so, what does that mean? Did we create our performance metrics based on our own internal lens, tried-and-true practices, and our own tools? Were we agile enough to evade the constant back-chatter that somehow HR always stands in the way of corporate progress? Did we react quickly enough to stay in step with the rapid evolution of the business, just enough to stay alongside our businesses so as not to trip and fall and impede the corporation’s goals? If so, then we’ve succeeded in just getting by. We get to stay for another year, possibly repeating the same exhausting moves, enough to keep us from getting outsourced or from consultants crying obsolescence. We’re better than this. To lead, we must not follow: we must innovate. It’s time to do more. It’s time to think bigger. It’s time to step in front of the company and perform like business owners, not line management order takers. HR deserves to be out there leading the charge. We must become larger than our tools, more expansive than our practices. We must stretch our minds and think bigger. As the CEOs of HR, our model is now irrelevant to a large degree: we must think with a different mindset. Innovation is the key to our future, lest we be relegated to the annals of business history. Good enough is no longer going to cut it; we must be brave and bold in a new, groundbreaking way. Our mindset matters. It affects our worldview, how we see the business. We must expand those minds, think bigger than any other division of the company. We must perceive the world as business owners. Our skin is in the game, even if we’ve never known it or realized it. Everything affects HR. Everything. Every data point, every market fluctuation, every customer complaint, every marketing strategy that impacts the performance of the company affects HR. Because it all touches capacity, our main product. 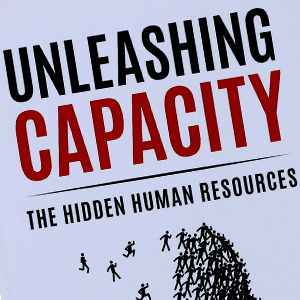 When I wrote about this concept in Unleashing Capacity: The Hidden Human Resources (Pinot, 2016,) I knew the concept was foreign to most HR practitioners. We’ve long thought about how we touch the company from the myopic view of our own products and services. Generalists consider how to maneuver the various HR tools to service their clients. Talent Acquisition providers think about how their tools can fill open positions or help plan for expansion. Organizational Development considers how to build stronger, more efficient teams based on corporate directives or immediate concerns. Compensation and Benefits help supply those tools to remain market competitive and increase retention. But when you step up to a C-suite view of the company, our role is so much larger than just those services mentioned. We are responsible for all resources human. We are the very lifeblood of the company, and as such are directly accountable for corporate capacity. There can be no mergers without us, no expansion. No customer service, marketing, operations, finance, technology, sales – there is simply no progress without people. The business cannot expand, reach or exceed its goals, or even operate without the humans who provide capacity. We own capacity, and it’s time to deliver more expansive strategies that can drive capacity now and in the future. We are the CEOs of capacity, and it is that capacity that is the future of not just our corporations, but of HR itself. We should be the center of innovation for the entire company. We are the genesis of all progress. To expand our thinking to that of business owners, to enable ourselves to step into these new roles, we need more information. If in fact all types of data points impact capacity, then we require more of them. The addition of data warehouses to our toolset is critical. Now more than ever, we require larger-scale systems that can gather and synthesize more information to give us the larger world view we need to operate. If we add our own data to that of the market, the customer, strategists, thought leaders, business minds, financial data and technical stats, we will be able to see trends, potential pitfalls and discover endless possibilities for improved capacity and profitability. As someone who has designed this type of data flow and a proprietary framework to go along with it, I can speak to its power. Big data allows us to get in front of corporate goals and show just how they’re either possible or laden with dangerous pitfalls. We can provide large-scale solutions that move the needle on productivity beyond what our C-suite partners can imagine. We have all the information on the people. If we add these vast data points to our world view, there’s no stopping the level of powerful influence we can have on capacity. The sky’s the limit. The path is ours for the choosing. But data is needed, and the new mindset must be adopted before we may begin. 2017 is quickly approaching. As we look to the future, do we want more of the same, or is this the year we assume the mantel of the owners of corporate capacity? The future is ours if we do, and big data is the way to that bright, prosperous future for all of us in HR. I want us to win, and I believe capacity is the key to our success. Rita is an international speaker on the subjects of business and HR transformation and ranked among the Top 100 Human Resources Officers by ExecRank in 2012. Great piece that plays to a number of bigger future enterprise themes, that of the learning organisation an environment where data points and digital insight inform how entities test and learn with agility by bringing their value propositions to life.. and the whole piece of piecework in the 21st century with the rise of sharing micro outsource platforms where organisations can globally source specialists to meet acute task based needs.